Now that Jessica's given you some ideas on creating beautiful tablescapes, all that's left to do is finish wrapping presents, right? Well hopefully you're at least that close to be completely done with your holiday gifting. My favorite way to do finish up gifts is by having a wrapping party with friends! Have everyone bring their own scissors, tape, paper (gifts of course) and some ribbon and embellishments to share. You can have snacks, a hot cocoa bar or a signature cocktail to make your spirits bright while you get your creativity on! Now that you have the essentials, let's start wrapping some gifts! Your presents are just as much a part of your decor as your tree. Stick with the same color scheme/theme as your tree and other decor for a cohesive look. Kraft postal paper is one of my favorite papers to use because of its versatility and minimal cost. You can find it at most big box retailers and office supply chains or find some online here. Once you have your main papers (or "backdrops" as like to think of them) picked out, you can begin. Remember to use at least one solid and one pattern for contrast. You can also create your own pattern with stamps. I love this block print idea from Miss Mustard Seed. When you have your gifts all wrapped, start adding on the extras. Ribbon, jute, fabric strips and leftover strips of your patterned paper make great add-ons for layering. I love this idea of using old clothing for fabric. Last but not least--you'll need a gift tag. The Internet is swarming with free printable tags so there's really no excuse to slack in this last step! If you don't have the time or ink to print some of those, make your own with come card stock, a whole punch and some scissors (to cut a decorative edge). And that's a wrap! Pun intended. 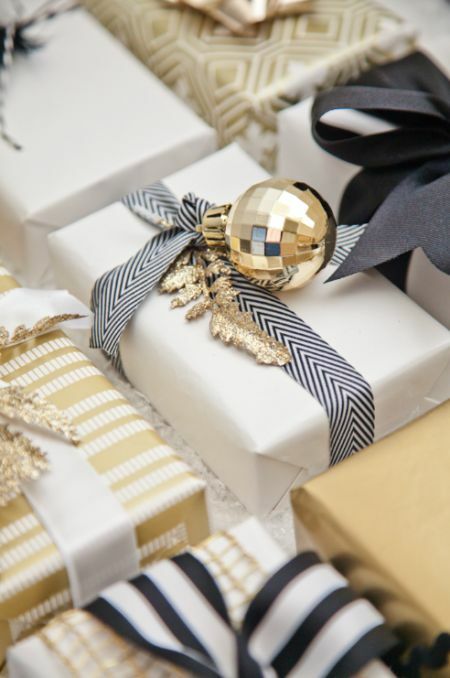 I hope these ideas get you motivated to make your gift wrapping a memorable part of your home's holiday decor!